“These defendants are illegally profiting from San Francisco’s limited stock of affordable housing,” said City Attorney Dennis Herrera on his lawsuit against against two people for defrauding the city’s affordable housing system. 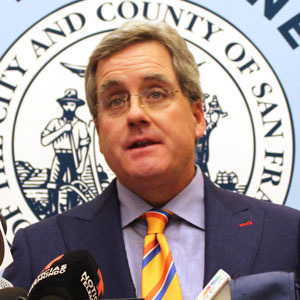 SAN FRANCISCO (May 11, 2017) — City Attorney Dennis Herrera today announced he filed lawsuits against two people for defrauding the city’s affordable housing system, the latest in a series of legal steps Herrera has taken to address San Francisco’s housing crisis. The two lawsuits filed in San Francisco Superior Court on Wednesday, May 10, 2017 allege the defendants either lied to obtain a below market rate condominium or deliberately flouted the purchase terms, taking advantage of a program designed to help low- and moderate-income households remain in an increasingly expensive city. Both lawsuits allege that the defendants’ misuse of their below market rate, or BMR, units was an unlawful, unfair and fraudulent business practice; violated the city’s Planning Code; and created a public nuisance. Along with the lawsuits, the city is serving notices of default on the defendants, which is the first step in collecting on promissory notes to the city that below market rate buyers sign to guarantee their pledge to follow the rules of the program. Those promissory notes are secured by a deed of trust on the BMR unit. San Francisco’s Inclusionary Affordable Housing Program is a major aspect of the city’s housing strategy. It requires developers to set aside a certain number of units to be sold to low- or middle-income households at below market rates in an effort to retain residents of all incomes in the city. Qualified low- and moderate-income, first-time homebuyers who wish to purchase a below market rate unit enter their names in a lottery. The lucky few whose names are chosen purchase the property for a below market price. In return, the households agree to abide by restrictions and conditions placed on the unit to ensure that the housing remains affordable and serves those most in need. For example, the purchasers must be a first-time homebuyer, occupy the property as their primary residence, and not rent it out without city approval. If a purchaser wants to move to another residence, the city facilitates the sale to another qualified buyer. But within months of the purchase, Bailey rented out the one-bedroom unit to a tenant and continued to do so for more than eight years. She did not notify the city or receive city permission to rent out the unit, but nevertheless collected rent. Bailey, meanwhile, lived in Chico, Calif., and then bought a home with her husband in 2015 in the Butte County community of Durham, Calif.
Then, in October 2016 and December 2016, Bailey filed unlawful detainer actions in court as the landlord of the property seeking to evict her tenant — reinforcing the fact that she wasn’t living in the unit and had rented it out. In the second case, defendant Rita Zakhrabova violated affordable housing rules by purchasing two below market rate units. Zakhrabova purchased her first below market rate unit at 400 Beale Street in 2002, and then she bought a second below market rate condominium unit at 333 First Street in 2005. To appear qualified to purchase the second unit, Zakhrabova lied by claiming she did not own the Beale Street unit and failed to disclose it on her list of assets. Zakhrabova, of course, was not qualified to buy the First Street unit in 2005, because she was not a first-time homebuyer. The complaint explains that Zakhabova also violated the program rules by failing to use the First Street unit as her primary residence. In fact, Zakhrabova — an employee of the city’s Human Services Agency — filed an official document in February 2015 attesting that she has continuously occupied the Beale Street property since she purchased it in 2002. In both cases the city seeks a court order requiring the property owners to comply with the law, including selling the property to a qualified low-income household if the defendant cannot or will not comply with affordable housing rules. The lawsuit also seeks penalties of up to $2,500 for each unlawful, unfair, or fraudulent act by the defendants, as well as penalties of at least $200 per day for violations of the Planning Code. Combined, those penalties could total hundreds of thousands of dollars per defendant. The City also seeks attorney’s fees as well as enforcement costs. The cases are: City and County of San Francisco, et al. v. Catherine C. Bailey, San Francisco Superior Court, CGC 17-558786, filed May 10, 2017; and City and County of San Francisco, et al. v. Rita Zakhrabova, San Francisco Superior Court, CGC 17-558787, filed May 10, 2017. Additional documentation from the case is available on the City Attorney’s website at: https://www.sfcityattorney.org/. To make a complaint about potential violations of San Francisco’s Planning Code or other municipal codes, call the City Attorney’s Code Enforcement Hotline, 415-554-3977.